Good to see the Grammar School is still remembered - what a shame it was disbanded. 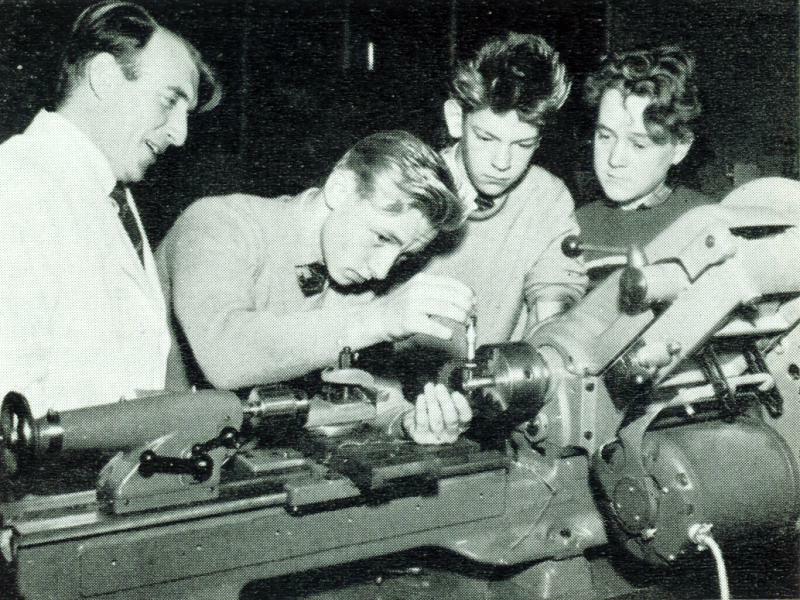 I'd already left by 1959 when the photo was taken but I do wonder why an academic school was teaching practical subjects like metal work. Wasn't the job of the technical schools? the site of the photograph is the new school building post 1958. I was there at the old school and moved over there when the old building was reassigned to another school. Joe Morton was a great teacher, not in an academic sense, but just a superb communicator. Always quick to encourage and praise and, another thing he kept quiet was that he was a young Spitfire pilot in the Battle of Britain. That's probably the lathe I started up with the chuck key still in the chuck, the key flew across the heads of old Morton and the rest of the class and landed on something soft at the other side of the room. No-one noticed so I sauntered over and picked it up before anyone did notice! Joey kept that quiet, he taught Colin Chapman engineering! Founder of Lotus cars- mentor to Graham Hill and Jim Clark- Wow! Good heavens - I vaguely remember Mr Morton - he was still the Metal work /woodwork teacher when I was at the school from 1976 to 1980! I'm not sure, but I suspect the photo (and the next one) were taken when the school opened at the site at Byron Street Burnley.